Yesterday I recieved my first issue of Powder Magazine in the mail and was delighted to see official word on a concept that I'd been hearing about for a few months. So what's the big deal? K2 is putting on a first-of-it's-kind backcountry comp. Taking place over three days in the Whistler Backcountry, invited athletes will hit nine different features in an attempt to win some of the $90,000 up for grabs. Mini Golf Invitational Premise:Introduce a new event/film shoot that showcases the progression of backcountry skiing in an exclusive rider focused format. The term ÃƒÂ¢? ?Mini GolfÃƒÂ¢?? has come to define short, highly technical lines that utilize natural terrain and lines that introduce man made or rider build features. 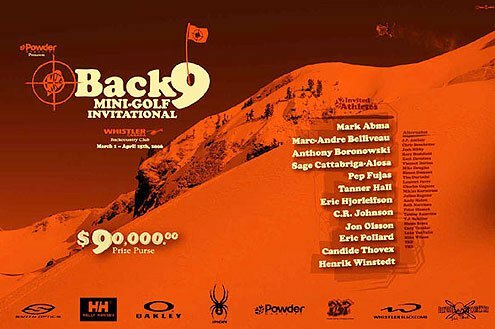 The K2 Back 9 Mini Golf Invitational is an event designed to document the evolution of trick focused backcountry or ÃƒÂ¢? ?mini golfÃƒÂ¢?? skiing from the athleteÃƒÂ¢? ?s perspective. The visionaries of our sport, the athletes, have been combining two totally distinct approaches to the skiing over the past decade. The idea of merging of technical park tricks with traditional big mountain skiing has given rise to an entirely new breed of skiers. Each year these multidimensional athletes challenge the notion of what can be accomplished on a pair of skis and in term the limitations of the sport. Many of these athletes have moved away from the competition focused environments in favor of traveling in search of new terrain and documenting this experience on film. The photographic and film documentation of backcountry skiing has been crucial to the advancement of the sport and any backcountry event would not be complete without their inclusion. This K2 Back 9 Mini Golf Invitational is not designed to be a competition, rather a relaxed opportunity for riders to converge on one location to document the sport of backcountry skiing. Invitational Rider FormatA total of 12 riders will be invited to the tournament with an additional 24 alternates. Riders will be posted in an advertisement for the K2 Back 9 Mini Gold Invitational. Event DatesTo ensure the best conditions and most progressive skiing during the tournament, the Mini Golf event will take place when the snow pack and snowfall in the Whistler backcountry are best. To ensure the conditions are suitable, the event will take place on three days between March 1st and April 15th, 2006. Much like the Eddie Aikau Invitational in the sport of surfing, a window of dates approach will make sure the event goes off under the correct conditions. Conditions will be monitored on the http://www.k2minigolf.com web site. When the Whistler area gets a cumulative snowfall of 30 cms, the event will take place and athletes will be notified. PrizesRiders will decide the winner of K2 Back 9 Invitational by voting blindly for the top five skiers at each hole. The winners will share a prize purse of $45,000. The top three riders with the lowest overall scores will be declared winners. In addition to these top three overall winners, prizes will be awarded to the winners of each hole. K2 Back 9 Mini Golf Invitational WebsiteK2 will launch a totally independent site designed specifically for the Back 9 Mini Golf Invitation named http://www.k2minigolf.com. The siteÃƒÂ¢? ?s main function is for providing information on the event. The site will include event information, rules, invited athlete list, an athlete registration page, cash prize breakdown, links to the contributing sponsorÃƒÂ¢? ?s page, and a weather tracker for the Whistler area. This site will serve as the forum where event updates and weather information are posted. Look's new colorway is sick.